Citizen Potawatomi Nation’s Aviary had several surprise visitors at the aviary since January; unfortunately, none of them were Wadasé Zhabwé. She continues to wear her telemetry and she has spent the majority of this year in an area southeast of Chickasha, Oklahoma, between Tabler and Alex in Grady County on the Washita River. Last month, there were reported and confirmed sightings of alligators along some of the same stretches the river where she’s been staying. That will be kept in mind the next time aviary workers go out to try and locate her or get a better idea of the landscape and habitat she’s chosen in that area. 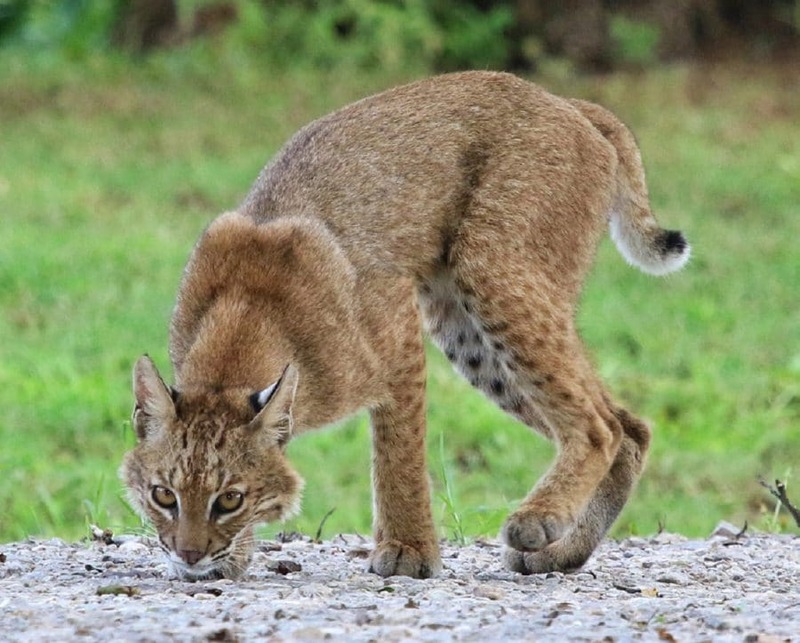 Wadasé hasn’t been visiting, but a young bobcat has. He made several late-evening and early-morning visits to the aviary, and aviary workers watched him hunting in the tall grass in the pasture several mornings in a row. On a Sunday evening after feeding the eagles, he was spotted walking down the driveway along the edge of the creek. At first, he was curious about his human audience and the camera as the shutter clicked. Everyone stood as still as possible with him less than 30 feet away. He took several steps in their direction, stopped and looked right at us before he turned to head for the cover of grass near the creek. It was a brief but breathtaking encounter. Learn more about Citizen Potawatomi Nation’s Eagle Aviary at facebook.com/CPNeagleaviary.